Yeah, if you grew up watching this series, there’s a pretty good chance that the theme song is playing in your head right now – it’s certainly playing in mine as I write this. 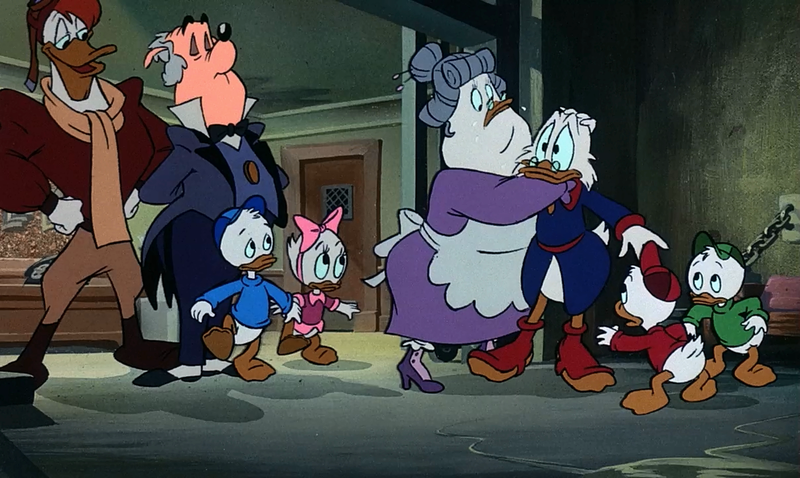 It’s practically obligatory at this point to mention it anytime the show is brought up – and I’m certain we’ll see it brought up again more and more thanks to the recent announcement from Disney that they would be reviving the show for Disney XD, likely due to the success of the remastered DuckTales video game and the ensuing renewed interest in the property. It’s certainly why I chose to review this movie, which just so happened to have been in my collection, thanks to the Disney Movie Rewards program, which was, up until recently, the only way to get it. Now, I actually don’t recall much from the TV series beyond the fact that it was among the wide range of cartoons I managed to fit into my viewing schedule as a kid. (The fact that I watched so many probably explains why I remember so little….) 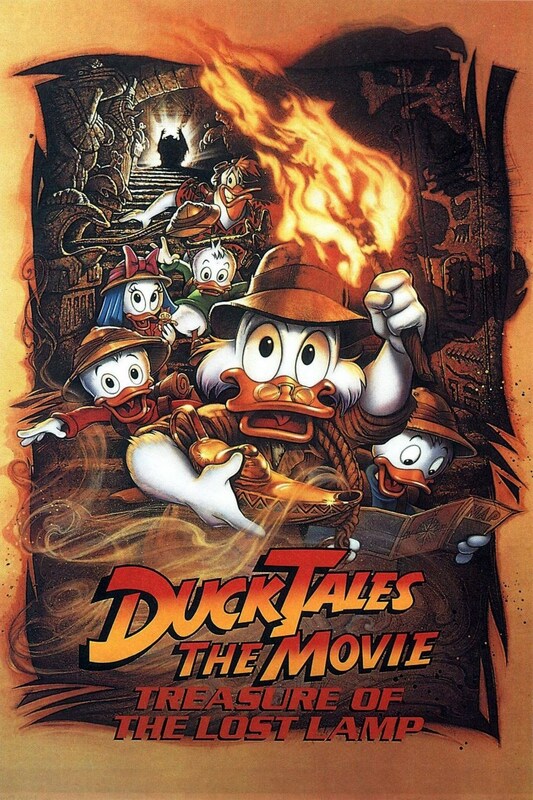 I actually have far more memories from other related shows from the Disney Afternoon era compared to this show – Darkwing Duck in particular is a favorite I’m kind of hoping they revive thanks to the whole superhero craze – but, even so, DuckTales still made enough of an impact on me to leave behind some residual warm feelings towards it. Most of this is thanks to the film extension of the show, Treasure of the Lost Lamp, which, along with 3 Ninjas, was pretty much my go-to movie for whenever I couldn’t decide on a rental I hadn’t seen before. 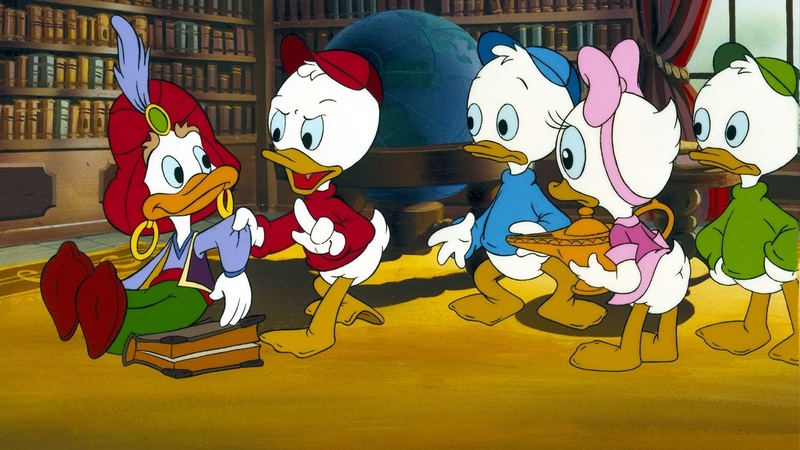 The film feels pretty much like any regular episode of the TV series, with Uncle Scrooge, accident-prone pilot Launchpad McQuack, and the four kids – Huey, Dewey, Louie, and token girl Webby – going on adventures in foreign lands and collecting valuable artifacts to add to Scrooge’s wealth or, as he notes here, to donate to museums, giving him a nice tax break. He’s basically Indiana Jones without the altruism (which sounds about right since the Uncle Scrooge comics DuckTales was based on were actually an influence on that character in the first place). Here, they’re in the Middle East searching for the treasure of Collie Baba and his Forty Thieves. The film jumps right into the action by having them quite literally stumble upon it right from the beginning. 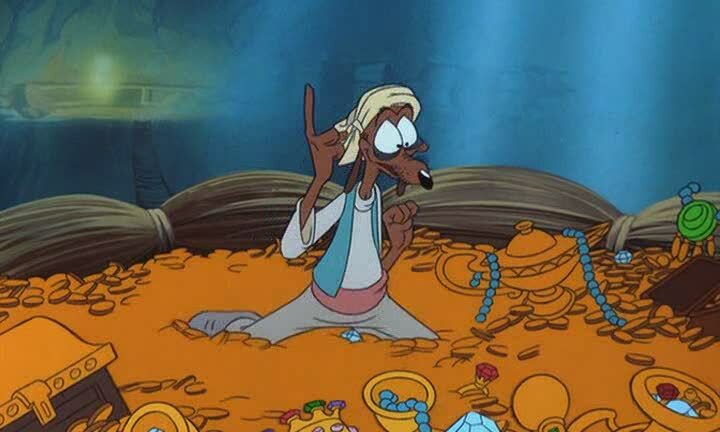 What they don’t know, however, is that among the gold coins and precious stones is an unassuming lamp that contains a wisecracking, hyperactive genie voiced by a famous comedian who is being sought after by an evil sorcerer who would use the genie’s power to take over the world. What’s that? Sound familiar? Well, yeah, it should. A lot of these plot developments were recycled for Disney’s far more successful Aladdin. I guess with Treasure of the Lost Lamp being a box office bomb, they thought they could have a do over. I’m not complaining, though, because, regardless of their similarities, the two films are different enough to work apart from each other, even if Treasure of the Lost Lamp feels like the rough draft for a much better final one. Yeah, once you’ve grown past the age of 10, it’s a bit of an unpolished, unexciting, and even slightly annoying movie. You see, Rip Taylor’s shrieking portrayal of the motor-mouthed Genie can become quite grating, particularly when you consider that the kids and main villain’s inept henchman, Dijon, already have potentially grating voices in the first place. For being a larger budget feature film adaptation of a smaller scale TV series, the plot doesn’t do much to make this feel like it’s worthy of the big screen treatment, either, instead feeling like either an extended episode or multiple episodes tied together – a common issue with big screen adaptations of TV series. Much of the film is spent with the kids making silly, kid-appropriate but no less small scale wishes that lend themselves to slapstick shenanigans at the expense of the adults’ dignity and sanity. 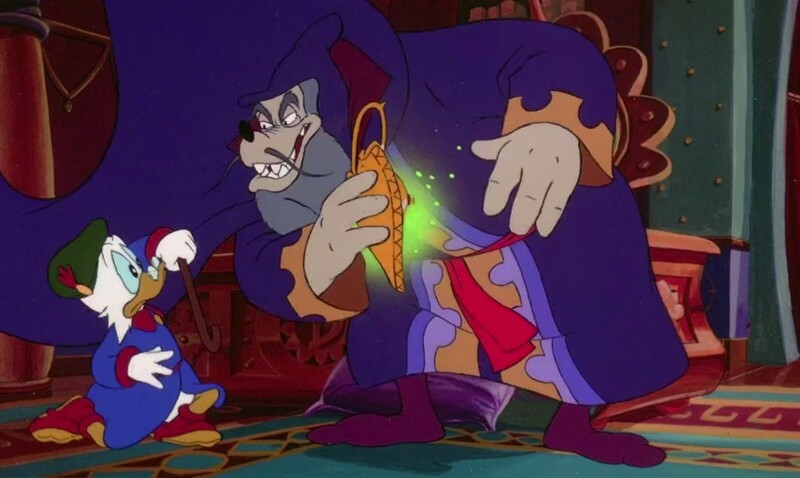 There are a few fun ideas here, no doubt, and, as a kid, these quick bits of wish fulfilment were definitely my favorite parts, but with the lower budget and a runtime of 75 minutes, DuckTales is obligated to hurry along so as to not break the budget getting to a final showdown with Merlock, the evil sorcerer whose amulet will allow him unlimited evil wishes. Merlock himself, at least, feels like a credible threat, even though he shifts between mysterious and menacing to comically clumsy on the fly and is dispatched fairly quickly. The animation in his beastly transformations are neat, and Christopher Lloyd gives him and the film itself a bit of theatricality and prestige. Then there’s the animation. I’m not going to fault the film much in this area, though it is, at times, incredibly rough. Try not to compare it to Disney’s higher budget films – this was the first film produced by what would later be known as DisneyToon Studios, a smaller studio within Disney that works on lower budget films that would become notorious for producing direct-to-video sequels and spin-offs to Disney classics, including Aladdin’s. Treasure of the Lost Lamp’s animation is inconsistent from scene to scene, with linework and paint (this was one of Disney’s last non-digital releases) looking detailed, clean, and polished one moment and then sloppy, choppy, and muddled for a theatrical film the next. I can only imagine it would’ve been better had they found some sort of happy medium in quality so that it would avoid the distracting inconsistencies, but at least, at the very worst, the film just looks like your average late-80s to early-90s Saturday morning cartoon, which is at least adequate. I doubt many kids would focus on this, though. I didn’t when I was a kid, and I’m certainly looking at this with a more critical eye than even the average adult viewer would. Taken on its own terms and as a first feature for the studio, it is, overall, an enjoyable, if not terribly exciting, adventure film that even modern kids would likely enjoy. I also recall liking Genie a lot better as a kid, and fans of Rip Taylor will likely have less of an issue with the character, too. Even though they have annoying voices, once you acclimate to them, Huey, Dewy, and Louie (and, I guess, Webby, whose main purpose is mainly to be a cute girl) are at least smart, resourceful kids who take part in the action without succumbing to the typical child-in-peril tropes you normally see, which is almost refreshing enough. My main wish with the film is that it were actually a bit longer so that we could have a better story arc for all the characters, new and old, and so that the film could be a little larger in scope than the average TV episode. It’s still fun, though, and it still has that catchy theme song.